A. Gofer (c/o Steph Newell) has won the inaugural International Aubrey Tearle Proofreader’s Derby (fittingly restlessly re-named from the 2014 Restless Derby). The neck-and-neck runners up are Catharine Morris aka Words and Things, and Kai Easton, with Rehab Abdelghany just missing out on a place at the post. A. Gofer (c/o Steph Newell) suggested some welcome improvements to the golf course at the Royal (henceforth Royale) Alibian Country Club and was therefore declared Overall Champoin of the Derby. In all fairness, it must be acknowledged that this competitor’s proofreading skills are not up to scratch and would not impress Aubrey Tearle. A. Gofer (c/o Steph Newell) would do well to put aside the golfing implements for a while and work instead at mastering the blue pencil. True proofreading skill was displayed in the entries submitted by Catharine Morris (Words and Things), Kai Easton and Rehab Abdelghany. Catharine Morris shows practised flair with the traditional handwritten marks and submitted the most adept, technically correct entry. Kai Easton and Rehab Abdelghany were also highly accurate. Carli Coetzee started promisingly and came up with some pleasing albeit fragementary corrigenda, but unfortunately failed to stay the course. I was also entertained by the entries of Graham Riach, Games Jraham and Carol Leff. My best wishes to all the competitors. It was, indeed, an impressive race: thanks to all who responded to the call to register for the competition. 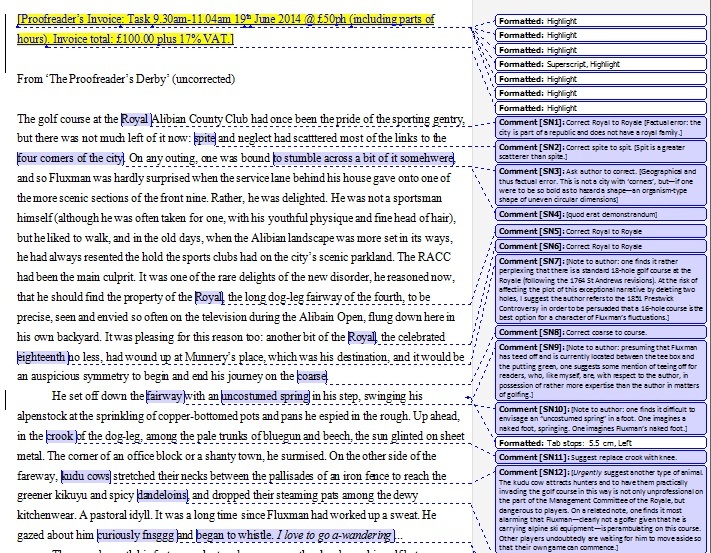 Those who ran the 2014 Derby intervened and corrected a section of original, re-uncorrected text from ‘The Proofreader’s Derby (Corrected)’, the disruptive heart of Vladislavić’s recently re-released novel The Restless Supermarket (And Other Stories, 2014, originally published by David Philip in 2001). The range of responses to Vladislavić’s section of original text that made up the 2014 Derby was wide, although all firmly falling into the spirit of the novel itself. Extract from winning 2014 Derby entry, corrected by A. Gofer (c/o Steph Newell). Click to view. Seen exclusively through the first-person narrator’s increasingly myopic eyes, the novel is set in the shifting inner-city of Hillbrow, Johannesburg, in the lead up to New Year’s Eve of 1994. It is both an example of Vladislavić’s remarkably attentive writing of place and of the inventiveness and remarkable facility with language that marks his body of work. The Proofreader’s Derby, which makes up the entire central section of the novel, is compiled from a lifetime’s collection of textual errors, which are somewhat reluctantly narrativised by the cantankerous, conservative Aubrey Tearle, a retired proofreader of telephone directories. 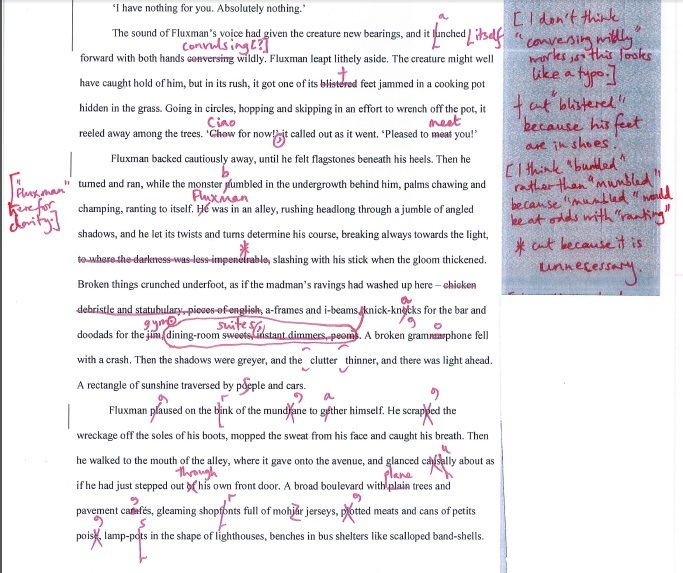 A competitive proofreading challenge that represents his life’s work, the Derby is Tearle’s challenge to what he sees as declining standards everywhere while his own controlled world rapidly recedes in the wake of apartheid: in its pages of Tearle’s fiction, the Derby’s hero, Fluxman, wields his distinctive delete mark over all social undesirables, as a brave corrector of his terrifyingly changeable landscape, a space and time which has descended into a ‘cacophony of categories, a jumble of kinds, an elemental disorder, wanton and fatal’. Me: I feel I should warn those who are not familiar with it, The Restless Supermarket is a deeply strange text (I paraphrase). – and having to re-occupy the distinctly unsympathetic character of Tearle in the process. Vladislavić discussed the possibility of Tearle’s reanimation (joking that he might now perhaps be living in an apartment in Hillbrow’s Ponte City building) because of Tearle’s peculiar but nonetheless enduring appeal, and sympathising with him, at least a bit, whilst also experiencing the discomfort of writing him in the first place, knowing that the discomfort meant that Tearle was probably being voiced just at the right pitch to convey his rampant, blindsided ego and conservative self-centredness. A question from the floor from a Derby runner opened up a discussion about keeping one’s ego in check when proofreading and editing, when engaging with and occupying someone else’s writing so closely, the temptation to write one’s own book, the difficulties of intrusion of self. For this particular runner and all those who ran the Derby, this occupation was of Tearle’s own bit of fiction, of Tearle’s text and his world. Staging the 2014 Derby also brought out the specific ironies of ‘The Proofreader’s Derby (Corrected)’ and its own life story to date. Vladislavić compiled the Derby as he wrote the other more continuous bracketing sections of the book, ‘The Cafe Europa’ and ‘The Goodbye Bash’, collecting scraps and oddities of error, ‘corrigenda’ as Tearle terms them, from newspapers and other sources, much as Tearle himself professes to through the novel. In its original conception, the Derby was to be published uncorrected, littered with its textual errors, the actual Derby competition text awaiting correction. Preparing The Restless Supermarket forits original publication (David Philip, 2001), though, Vladislavić was aware of how much the reader was being asked to shift focus in the middle of the book to enter the new, reflexively fictional world – and Tearle’s world at that – that the strangeness and riot of all the errors – typos, repetitions and difficult formulations – may actually just be too much. As these suspicions began to be confirmed by the novel’s first readers, it became clear that the Derby needed to be presented corrected. Vladislavić then went back and proofread it: ‘The Proofreader’s Derby (Corrected)’ stood corrected. Extract from runner-up Catharine Morris’ (Words and Things)’entry to the 2014 Derby. Re-revisiting the text in 2014, for the version that has heralded the inception of the new competitive sport that is this year’s Restless Derby, Vladislavić revisited the original Proofreader’s Derby, the uncorrected manuscript text. Going back through his papers, Vladislavić found the original ms typewritten: for an Aubrey Tearle International Proofreader’s Derby in the year of 2014, a digital version had to be procured. And then re-uncorrected. And that is the race the 2014 Derby runners have trained for, prepared for, completed – intervening, occupying and correcting original, corrected-re-uncorrected text from Aubrey Tearle’s opus and life’s work, ‘The Proofreader’s Derby’. I’d like to also extend thanks to Stefan Tobler and Nicci Praca at And Other Stories for their encouragement and enthusiasm for the, frankly, slightly bonkers idea floated partly in jest. Thanks, too, to the School of English at Sussex, and especial thanks to John Masterson, and to Steph Newell for the Derby Awards, and also to Jo McGregor at the Sussex Africa Centre. As we prepare for the next Derby, please remain vigilant: we will always welcome any silliness of error spotted or need for deletion. For more information on this cause, copies of The Restless Supermarket and Vladislavić’s other novel re-released by And Other Stories, Double Negative, are available from their website. Thank you, Katie, for this coverage; running the Derby was a unique and exciting experience because proofreading a work of fiction by a writer who is so fond of language is deliciously challenging. When Fluxman threatens to ‘delete’ the stick, the proofreader stands at a loss and is forced to suspend her/his own ‘delete’!